Each of these groups is associated with a panel on the Log QSOs tabbed dialog. The QSO panel is always present; you can independently control the presence of the Auxiliary, QSL, Online QSL, Award, Contest, Propagation, Details, and User-defined panels using the Log Panel checkboxes in the Configuration window's Log tab or using the eight checkboxes to the right of the QSO panel. All information items are stored with each QSO, whether or not the panels displaying them are visible. This allows you to adjust DXKeeper's consumption of screen real estate to meet your operating needs of the moment. Dates displayed in the above panels follow the short date format specified in the Windows Control Panel's Regional and Language Options applet's Regional Options tab. Located at the bottom of the Main window's Log QSOs tab, the Log Page Display contains one entry for each QSO in the current Log file, subject to settings in the Filter panel. Each entry in the Log Paged Display corresponds to one QSO in your log. If you select a QSO by clicking it's entry in the Log Page Display, the panels above will display the information items stored for that QSO. If the QSO's duration is non-zero, the QSO panel displays the duration in mm:ss notation; the QSO panel also displays the full name of the station's DXCC entity, as well as the DXCC prefix and country code assigned to this entity by the ARRL. Some of these items are also shown in the Log Page Display; the caption at the top of each column identifies the information item in the cells below it. If you select a QSO that contains one or more items that contain an invalid value, or select a QSO that is missing a required item, clicking the Log or New buttons or attempting to select another QSO will flash the labels of any such items in red font, and the QSO will remain selected; if the Provide audible feedback box is checked, the "Windows Default Beep" will play each time the labels flash. Frequencies not falling within a defined band are considered invalid. Callsign validity checking can be enabled or disabled via the Flag Invalid Callsigns setting. If an item's data exceeds its specified maximum length, its label will be flashing in red and the Log button will not enter the QSO into the current log. Until you correct the error(s) causing the item labels to flash or until you delete the QSO, the New, and Log buttons will not function, and you will be unable to select another QSO. Disabling the Flag Invalid Callsigns option will immediately stop an invalid callsign from being considered invalid. When first installed, DXKeeper's Log Page Display is configured to show 8 of items stored with each QSO. You can add or remove items from the Log Page Display using the Log page fields control in the Log Layout panel on the Configuration window's Log tab. You can also change the order in which the columns appear. Whether all items in the Log Page Display will be simultaneously visible as columns depends on their number and width, as well as the width of the Main window. If all items are not simultaneously visible in columns, a horizontal scrollbar will be displayed along the bottom of the Log Page Display; you can use this scrollbar to select the items you wish to see. The small black rectangle to the left of the horizontal scrollbar can be dragged to the right to split the Log Page Display into two independently scrollable sets of columns. You can adjust the boundary between the two sets by dragging the black rectangle to the left of the horizontal scrollbar at the bottom of the right-hand set of columns; to eliminate the right-hand set of columns, drag its black rectangle all the way to the left. Dates displayed in the Log Page Display follow the short date format specified in the Windows Control Panel's Regional and Language Options section. The format selected must specify a 4-digit year. A Log Page Display entry will be rendered in red font if its Callsign, Band, and Mode match those in the Capture window; this can help avoid making duplicate QSOs. With the Log QSOs tabbed dialog selected, resizing DXKeeper's window allows you to vertically and horizontally expand or contract the Log Page Display. Vertical and horizontal scrollbars allow you to view all cells of all rows in the log page display. The four VCR-like control buttons on the Log QSOs tab allow you to select the first, previous, next, or last QSO in the Log Page Display. You can similarly navigate the Log Page Display using the CTRL-Home, PageUp, PageDown, and CTRL-End keys respectively. 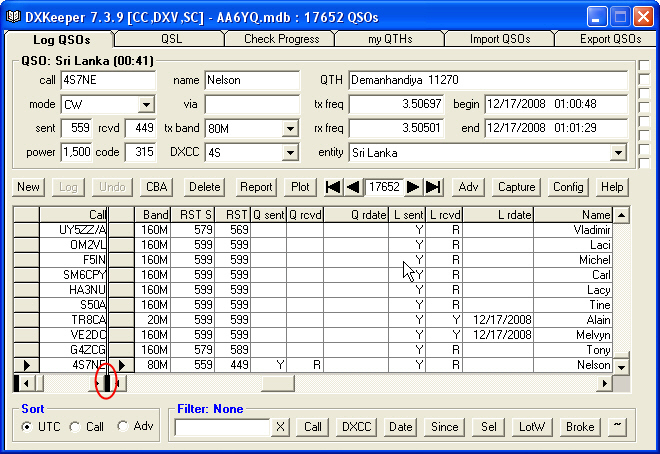 The number displayed between these control buttons indicates the position of the currently-selected QSO in the Log Page Display as it is presently sorted. Note that the Auxiliary panel's QSO# item does not represent the QSO's order -- beyond the fact that a QSO with a smaller QSO# was logged before a QSO with a larger QSO#. Upload to LotW: SL(SC): immediately uploads entry's QSO to the the ARRL's Logbook of the World using the Station Location SL. If SL does not specify a Station Callsign, the QSO's Station Callsign item will be used, and will be shown in the menu command as (SC). Display eQSL: if the entry's QSO is confirmed via eQSL and if an eQSL.cc username and password have been specified; displays the previously-downloaded QSL image for this QSO (if present) or displays a QSL image downloaded from eQSL. If the Highlight duplicate QSOs box is checked, then entries in the Log Page Display whose callsign, band, and mode match those of the Capture window will be highlighted in red font. If the Indicate LotW & eQSL AG status box is checked, then the background colors of entries in the Log Page Display will indicate whether the entry's callsign is a known participant of LotW and/or an Authenticity-Guaranteed member of eQSL.cc. If a callsign is found to be a known participant of LotW but not an Authenticity-Guaranteed member of eQSL.cc, the callsign's background color is set to yellow. If a callsign is found to be an Authenticity-Guaranteed member of eQSL.cc but not a known participant of LotW, the callsign's background color is set to pink . If a callsign is found to be a known participant of LotW and an Authenticity-Guaranteed member of eQSL.cc, the callsign's background color is set to cyan (light blue). If SpotCollector is installed, however, the background colors specified on the Spot Database Display tab of SpotCollector's Configuration window - if not too dark - are used in place of yellow, pink, and cyan. Information shown in the Callsign Progress window's grid is automatically updated when a new QSO is logged with the selected callsign, or when existing QSOs with the selected callsign are modified. You can modify items in the currently selected QSO by directly modifying the item textboxes. After a QSO is recorded by clicking the Log or New buttons on the Main window's Log QSOs tab or by clicking the Log button on the Capture window, the Require Edit to modify logged QSOs setting determines whether the Edit button must be clicked before making changes to that QSO. If Require Edit to modify logged QSOs is enabled, then attempted changes will be ignored until the the Edit button is clicked, after which changes are permitted, and the Edit button is replaced by a Save button that can be clicked to record the changes. If Require Edit to modify logged QSOs is not enabled, changes to items in the current QSO can be made at any time; such changes can be recorded by clicking the Save button. Changes are also recorded by taking any action that causes another QSO become selected. If your modification to one or more critical items in a QSO makes those items invalid, clicking the Log or New buttons or attempting to select another QSO will flash the labels of any such items in red font, and the QSO will remain selected; if the Provide audible feedback box is checked, the "Windows Default Beep" will play each time the labels flash. Frequencies not falling within a defined band are considered invalid. Callsign validity checking can be enabled or disabled via the Flag Invalid Callsigns setting. If an item's data exceeds its specified maximum length, its label will be flashing in red font and the Log button will not enter the QSO into the current log. Until you correct the error(s) causing the item labels to flash or until you delete the QSO, the New, and Log buttons will not function, and you will be unable to select another QSO. Disabling the Flag Invalid Callsigns option will immediately stop an invalid callsign from being considered invalid. You can make your changes permanent by clicking the Save button, or back out your changes using the Undo button. 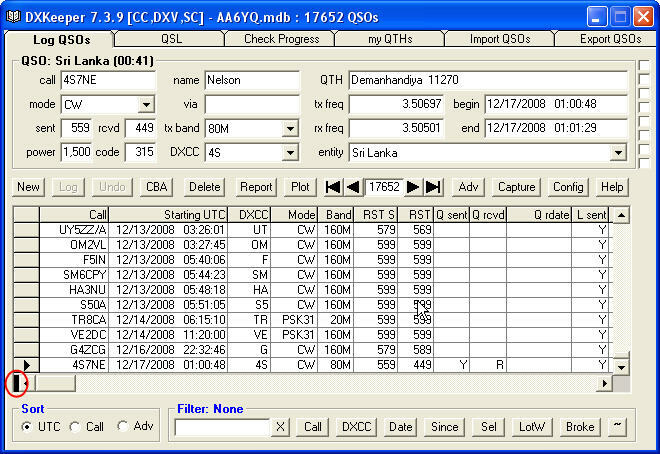 DXKeeper also provides the ability to modify multiple QSOs en masse. You can delete the currently selected QSO by clicking the Delete button. If either the Confirm QSO deletion or Require Edit to modify logged QSOs settings are enabled, you will be prompted to confirm the action. You can delete all QSOs in the Log Page Display by depressing the CTRL key while clicking the Delete button; this action always requires confirmation. There is no undo operation for a confirmed delete operation. if Audio Recording is enabled with the Automatically delete QSO Audio file option also enabled, deleting a QSO that specifies an audio file will automatically delete that audio file.